Over the weekend, members of University of Oklahoma's Sigma Alpha Epsilon fraternity were caught on video chanting racial slurs. That kicked of a controversy that has played out largely online - and provided new rules for how to handle a social crisis. 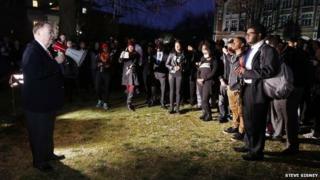 Within 48 hours of the video being posted, the university's president had joined a campus rally condemning the video, sent out a press release, held a press conference, evicted SAE members from the fraternity buildings and expelled two students. The whole controversy played out on social media from the leaked video to the University of Oklahoma President Boren's few, well-executed tweets. It was public, it was viral, and it moved quickly. "Every crisis is harder to manage because of social media because so many people have so many different opinions about every event," Gerard Braun, a crisis communication expert and speaker, told BBC Trending. "Every day is Judgement Day on social media and every minute is Judgement Day on social media." The incident whipped up a Twitter response that gathered over 50,000 comments under the hashtag #SAEhatesme. While the video may have helped spark the international reaction, it also provided leverage for administrators. "Technology today gives you irrefutable proof that the incident happened," says Braun. "Twenty years ago there may have been murmuring or rumours that that took place but it would have been impossible to prove." Boren has been public on social media, tweeting Sunday evening, soon after the video leaked: "If the video is indeed of OU students, this behaviour will not be tolerated and is contrary to all of our values. We are investigating." Boren also used more traditional methods, a move Braun approves. "He appropriately used traditional media and a traditional news conference issuing depth instead of just using 140 characters…You can't tweet yourself out of a crisis," says Braun. But he also says that ignoring Twitter outright is folly. "If an organisation or individual gets a press conference together in an hour, I know it's 59 minutes slower than Twitter," said Braun.